John Adolphus Bernard Dahlgren was born November 13, 1809, and joined the U.S. Navy in 1826 where he received training in advanced mathematics, scientific theory, and the use of precision instruments while serving on the U.S. Coast Survey (1834-1837). Ordered to ordnance duty at Washington Navy Yard in 1847, Dahlgren’s first task was to develop rockets for use on board warships. He did the job so well that the Chief of the Bureau of Ordnance and Hydrography assigned him ever increasing responsibilities, empowered him to expand the Yard’s facilities at his discretion, and arranged for him to remain on ordnance duty indefinitely. Dahlgren served in Washington for the next fifteen years. In the early 1850s, Dahlgren launched the Ordnance Establishment, the first sustained weapons Research & Development (R&D) organization and program in American Naval history. Its work fell into four broad categories: manufacturing ordnance and equipment, inspecting ordnance produced at private foundries, testing ordnance and inventions, and research and development. The facilities that Dahlgren set up at the Washington Navy Yard included a firing range along the Anacostia River dubbed the â€œExperimental Battery,â€ foundries, machine shops, and expanded office spaces. The facilities became the seed of the Naval Gun Factory. Dahlgren’s R&D efforts yielded integrated systems of shipboard armament, featuring light bronze boat guns, heavy smoothbore shell guns, and later, heavy rifled cannon. The boat guns were revered throughout the Navy and admired around the world. The heavy smoothbores, characterized by their peculiar “soda-water bottle” shape, were his most famous invention. Their design stemmed from Dahlgren’s scientific research in ballistics and metallurgy. To ensure their reliability, he had them manufactured under the most innovative and comprehensive quality control program seen in the Navy to that time. When first introduced to the fleet in the mid-1950s, Dahlgren guns were the most powerful and reliable naval cannon in the world. They remained the Navy’s standard armament until replaced by steel rifled cannon in the 1880s. In the process of inventing and developing cannon, Dahlgren articulated an unusually comprehensive conception of naval ordnance, including its role in naval strategy and tactics and national policy. An advocate of steam propulsion, he devised doctrine for what he considered the optimum balance of steam, sail, and ordnance in naval vessels. And he improved ordnance equipment of all kinds, including locks, sights, carriages, the rope used for breeching tackle — even the preservative coating used to protect gun barrels from rust. Promoted to commander in 1855, captain in 1862, and rear admiral in 1863, Dahlgren became Commandant of the Washington Naval Yard in 1861 and Chief of the Bureau of Ordnance in 1862. He spent most of the first two years of the Civil War meeting the Navy’s vastly increased demands for ordnance. Abraham Lincoln often visited the Yard to chat with Dahlgren, who had become the President’s favorite naval officer, principal uniformed adviser on naval affairs, and friend. During the Civil War, Dahlgren’s guns were mounted on almost every Union ship and many Confederate naval vessels, including the USS Monitor and CSS Virginia, which fought history’s first duel between ironclad warships, and the USS Kearsarge, which sank the CSS Alabama, the most successful commerce raider of all time. Not one of Dahlgren’s 9- or 11- inch guns — the principal heavy calibers — failed prematurely in combat. With help from Lincoln, Dahlgren left Washington in July 1863 and took command of the South Atlantic Blockading Squadron. For the next two years, he led naval forces besieging Charleston, the Union navy’s most frustrating campaign. After the war, he commanded the South Pacific Squadron, the Bureau of Ordnance, and once again, the Washington Navy Yard, where he died on July 12, 1870. John Dahlgren is buried in Philadelphia’s Laurel Hill Cemetery between the graves of his son Ulric and his first wife, Mary Bunker. He also had a son Charles with Mary, and three children, Eric, Ulrica, and John, with his second wife Sara Vinton. John Adolphus Dahlgren possessed enormous persistence, drive, and self discipline. He gave American sailors something they never had before: an unshakeable faith in their guns, a faith justified by the existence of an organization founded on the idea that systematic research and development could produce safer and more powerful weapons. 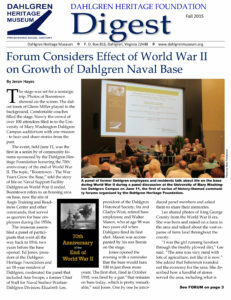 That idea was Dahlgren’s most important contribution to the American naval tradition. By: Dr. Robert J. Schneller, Jr.